Sales Activities Report is available for Plan Performance and above. More info on Sellf Plans are available here. Want to know who is your best performer in your team? Get a clear overview of your team performance over time and give them instant feedback on their own activities. How many calls does it take to generate a new lead? How many events for a deal to be closed? 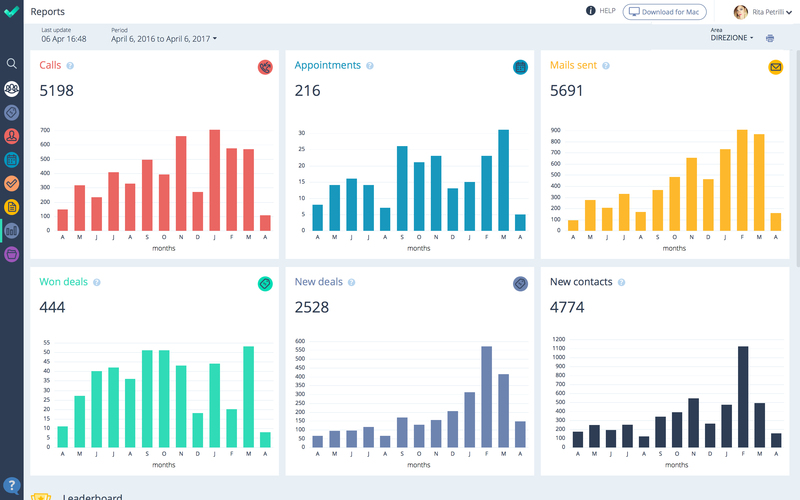 This report gives you instant access to stats on calls, events, mails sent, newly created deals and contacts added by your entire team. Your team members will have access only to stats on their own activities and the activities of the Area in which they are working. Each report can be filtered by Area of your team you can adjust the date range to see how the distribution of your team activities changes over the time. The all new date filter allows you to filter this report choosing any time period. Remember that each report updates every 30 minutes/1hour. Check your Last update date. In addition to the activity overview, our leaderboard shows you the level of activities in your team and their achievements in terms of calls made, events, mails sent, won deals and new leads added. You will immediately see who is closing more deals and you will be able to identify early on if someone is having issues and immediately help them. Leaderboards create also a friendly competitive atmosphere and keep your team motivated to always perform at their best. Sales Pipelines Report: how’s my Sales Team Performing? Sales Sources Report: what are my best customer acquisition channels? Deal Loss Reasons Report: why your team is losing deals?